Advance Directive | Hospice Care in Michigan | Universal Hospice Care Inc. The social work services at Universal Hospice Care Inc. are always available to assist patients and families with the discussion of preparing an Advance Directive. If you choose to complete an Advance Directive, these forms are available at Universal Hospice Care Inc.
An advance directive is a form where you can write down what type of care you want or who you want to make those decisions for you, if you cannot make those decisions for yourself. 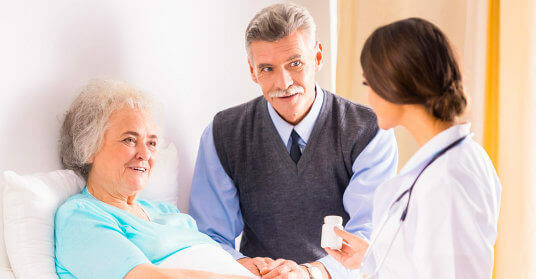 There are many kinds of advance directives with different names such as a “Health Care Power of Attorney,” “Patient Advocate Designation,” or a “Do Not Resuscitate Order.” The form discussed here is called a “Patient Advocate Designation (DCH-3916).” Upon signing this form, you select a person called your “Patient Advocate.” A patient advocate carries out your wishes or makes decisions about your care, but only when you are so ill or injured that you cannot make your own treatment decisions. You have the opportunity to complete an advance directive and send it to a statewide registry. This document explains how to complete an advance directive known as a “Patient Advocate Designation,” and submit it to the registry if that is what you choose to do. 1. Do I need to have an advance directive? No. You do not need to have an advance directive. No family member, hospital, or insurance company can force you to have one or tell you what the document should say if you decide to write one. 2. Why would I need an advance directive? There may be times when you cannot make treatment decisions because you are seriously ill or injured. This might be for a short-term illness or injury or it might be for something that is permanent. No one likes to think about not being able to take care of themselves or make their own decisions. By talking about it with those close to us and writing down our wishes in an advance directive like the one included here, we can help ensure our wishes will be honored in the future. 3. What can a patient advocate do? You can give a patient advocate power to make those personal care decisions you normally make for yourself. For example, you can give your patient advocate power to consent to or refuse medical treatment, or arrange for care in a hospital or nursing home. You may also give your patient advocate the right to make decisions about mental health treatment, to donate your body or your organs after you die, or to withdraw or withhold life-sustaining treatment, but these are all optional. Also, under state law, a patient advocate may not withdraw or withhold life-sustaining treatment that could result in your death if you are pregnant. You can explain your wishes regarding the care you would like to receive in the “Statement of Wishes” section of the form or you can leave this section blank. 4. What is the duty of my patient advocate? They must take reasonable steps to follow your wishes and the instructions that you gave when you were still able to participate in your care, whether you wrote them down or told someone. Your patient advocate must also always act in your best interests. 5. Whom can I appoint as a patient advocate? Is this someone who can respect my wishes even if they are different from what they would want for themselves? Is this someone who can ask questions and make difficult decisions? Is this someone who can consider input from other people who care about me and handle conflict if they disagree? Make sure you speak with the person you want to name as a patient advocate before you complete and sign the designation. You want to be sure that he or she is willing to serve. Your patient advocate must sign an acceptance in order for the designation to be valid. It is also a good idea to choose a second person in case the first person is unable to serve as your patient advocate. 6. When does this form take effect? Your patient advocate can make decisions for you only when you become unable to make treatment decisions yourself. If you give your patient advocate power for mental health treatment, they can make decisions for you when you are unable to give informed consent for mental health treatment. Until that time, you will make your own decisions. If, later, you are able to make decisions and participate in your care again, your patient advocate will no longer have the power to make decisions for you. 7. Who determines I am no longer able to participate in health care decisions? The doctor caring for you and another health care provider or licensed psychologist will make this decision. For mental health decisions, you may write which doctor and mental health professional you wish to make this decision. The place to do this is in the “Power Regarding Mental Health Treatment” section of the form. You should state in the form if your religious beliefs prevent you from having an examination by a doctor and explain how it will be determined that you are no longer able to participate in health care decisions. 8. Why is it important to express my specific wishes? Your wishes cannot be followed if no one is aware of them. It can also be a burden for your advocate to make a decision for you if you have not told them your wishes. If you have specific decisions you wish to be carried out, tell your patient advocate. You can also write these wishes down on the form. If you do not express your wishes, your patient advocate must act in what he or she sees as your best interests. Think about what treatment you would like under various circumstances in the future. Think about whom you might choose as your patient advocate. This is an important choice, as you are giving that person power to make decisions for you if you are not able to make them. Any advocate you choose must be willing to take on the responsibility. Make sure that you discuss this with them. Talk about these issues with people close to you, or other people that you trust. You may want to talk to family members, close friends, or a spiritual leader. 10. Can I use a different form? Yes. You do not have to use the form provided here. There are a number of organizations that provide different forms for free or you can have a lawyer draft one for you. 11. Are there rules for completing the form? Yes. You must select your patient advocate in writing and be of sound mind when you do so. You must sign the designation and there must be two adult witnesses with you when you sign. There are limits on who can be a witness. For example, witnesses cannot be family members, your doctor, your proposed patient advocate, an employee of a health facility or program where you are a patient or client, a person named in your will, or an employee of your health or life insurance provider. 12. What does a patient advocate need to do before acting on my behalf? Before the patient advocate can act, he or she must sign an acceptance. This can be done at the time you complete the document or later. 13. Can I change my mind after I complete the form? Yes. You may want to name a different patient advocate or change some of your wishes. As long as you are of sound mind, you can sign a new document and destroy the old one. Even when you are seriously ill or injured, you can cancel your patient advocate designation. You can do this by showing in any way that the document does not reflect your current wishes. It does not have to be in writing. Also, any spoken wish to have a specific life-extending treatment provided must be honored by a patient advocate even if the wish is not the same as or even included on the form. You can waive your right to cancel your patient advocate designation for mental health treatment for 30 days. During this time, the patient advocate may still make decisions for you. 14. What should I do with a completed form? You, your doctor and your patient advocate should have a copy. Let people know who your patient advocate is. Also, consider sending a copy to the Peace of Mind Registry. 15. What is the Peace of Mind Registry? The Peace of Mind Registry is a free and voluntary statewide registry. This registry will maintain a copy of your advance directive in a manner that allows healthcare providers to access it if needed. If you send your form through the mail, the registry will maintain an electronic copy and the original will be returned to you. An electronic option will also be available via the Peace of Mind Registry website. For more information, visit www.mipeaceofmind.org, or call 1-800-482-4881. 16. What if I decide not to have an advance directive? Decisions would still have to be made for you when you become unable to make them. Sometimes, a doctor or hospital staff will accept a spouse or adult child as an informal decision-maker. In some situations, a family member has some role by law. At other times, a guardianship proceeding will have to be initiated in probate court. 17. How can I get help? You do not need a lawyer to complete this form, but if you would like a lawyer to help you or have other questions, you have some options. If you can afford to pay something for a lawyer’s time, a lawyer referral service can direct you to someone who can help. If you would like legal help but cannot afford to pay a lawyer, contact your local legal aid office. You may also want to consider asking a friend or family member to read these materials with you, or contacting the Peace of Mind Registry with questions at 1-800-482-4881. 18. Where can I find a summary of this information to give to my patient advocate? They have to sign the acceptance form before they can act as your advocate. This does not have to be done at the time that you sign it, but they should sign it as soon as they can. They cannot act as your advocate until they accept, so if something happens in between the time you sign and the time your advocate signs, your wishes might not be honored. They only act as your advocate when you are too ill or injured to make your own treatment decisions. Your advocate does not get to make decisions about all of your care all the time. They have an active role only when doctors say that you cannot make your own decisions or give informed consent for mental health treatment. Your wishes and best interests are important. These things should guide whatever decisions your advocate makes when you cannot. This means that your advocate needs to know what care you might want in the future and be ready to act in your best interests if you do not share what your wishes would be. However, your advocate cannot make any decisions for you that you could not make for yourself if you were still able to participate in your care. This is a big responsibility. Your advocate will be asked to make decisions about your care and treatment. This includes refusing or agreeing to different kinds of treatment, and making plans for how to care for you. Your advocate may have access to your medical records to make these decisions. If it is not clear from the form what you want for your care, your advocate will have to make decisions based on what he or she thinks would be best for you. This may not always be the same as what your advocate would want for him or herself, or what your family or friends think is best, so your advocate should be able to handle conflict if it comes up. Also, your advocate will not get paid for serving as your advocate, and they should be comfortable with that. An advocate can change their mind at any time. If they do not want to be your patient advocate anymore, they just have to say so. If they change their mind before they are actually asked to serve (before you are too sick or injured to make decisions), they just have to tell you. If they change their mind while serving as your patient advocate, they should tell your doctor. Share this information with them. These questions and answers as a whole will help explain what role they will have if they agree to be your patient advocate. If your patient advocate still has questions, they can ask a friend, family member or lawyer to help them.